One thing we know about Agent 47 and the people he deals with? They all like to drive Audis. Agent 47 (Rupert Friend) is a Hitman, a genetically-modified individual with advanced intelligence, little to no emotion, and a expert in all phases of combat. He is one of many created and put on Earth to do one thing and one thing only: Kill. One of Agent 47’s many contracts leads him to his past. The contract he is given tasks him with eliminating Dr. Litvenko (Ciaran Hinds), the creator of the Agent program, and Katia van Dees (Hannah Ware), a young woman with questions about where she comes from. Knowing that 47 is coming for Katia, it is up to CIA agent John Smith (Zachary Quinto) to protect her at all costs, for she holds the key to unlocking massive potential. 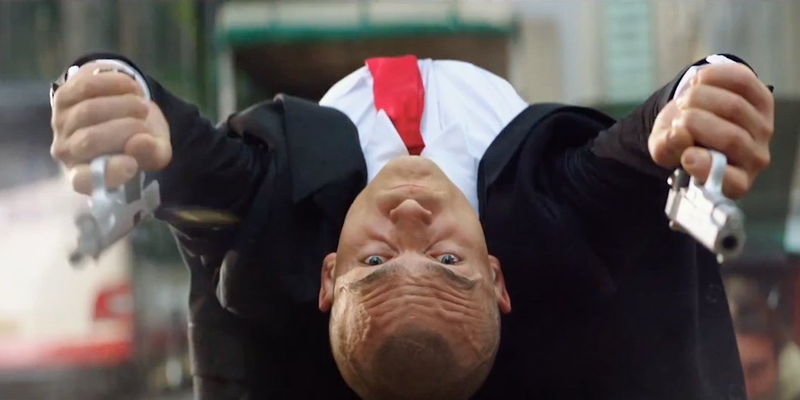 Honestly, it is hard to come up with the words to talk about Hitman: Agent 47. Unlike the bottom of the barrel or the top of the heap which give ample talking points on either side of the quality spectrum, it is often the things that fall in the spot of average to slightly below-average that are a pain for yours truly to put his thoughts out on. H:A47 occupies that ground. Those that forget the past are doomed to repeat it. In what world is hiring the writer for the negatively received Hitman movie of 2007 a good thing? Yet, that is what 20th Century Fox decided to do by hiring Skip Woods (A Good Day to Die Hard, X-Men Origins: Wolverine) to pen the reboot of the video-game franchise on the silver screen. Most of the backstory is crammed in a clumsy/distracting three minute opening credits sequence that tries to bring non-gamers up to speed as it pertains to the Hitman lore. The dialogue (which is found more than expected), ranges from average to pitiful, and it is about 15 minutes in when one realizes that most do not sound natural at all. All attempts at deeper themes such as free will miss the mark as well. It isn’t laughably bad dialogue, either, it is just bad, even the clearly intended “humorous” moments. It is best to watch H:A47 with the hopes of just seeing the occasionally entertaining action sequence, and luckily, a few are present. Every director has to cut their teeth somewhere, and this film is director Alesander Bach’s first foray into directing a movie. There’s a fair deal of overproduced, CGI, shaky, and bullet-time sequences that could have been reigned back in quantity, but on average, the action is competently filmed for a first-timer. Gunplay is reminiscent of a poor man’s John Wick, especially a scene very early in the runtime. 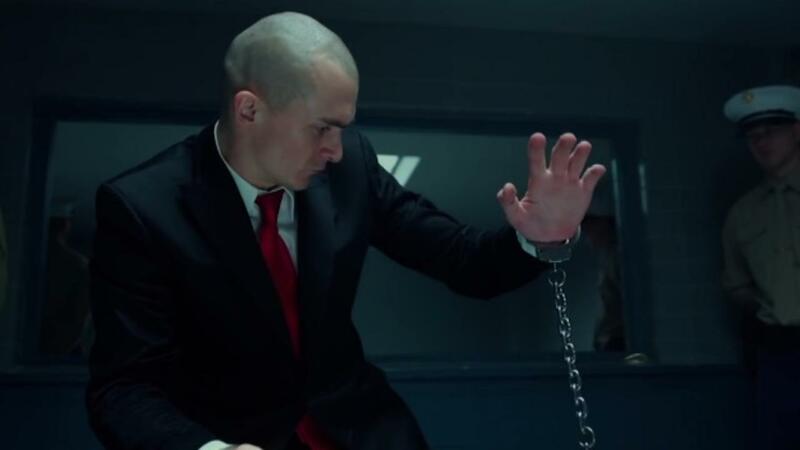 With that said, and I’m not usually a stickler for a film having to adapt its source material 100%, it is jarring to see Agent 47 open up fire in public place when he doesn’t have to. The Hitman series has built its foundation on stealth and creativity within an environment, heavily penalizing the use of a gun. I’d argue that because so much of the audience viewing are Hitman fans, there should be a commitment to capturing the essence of the series and making fans happy first and foremost in this particular case. Not to mention, going a predominately stealth route like the games could actually move the needle a bit for people on the fence, because it would be so different from the average action flick. Glimpses of what could have been are seen, so it can and should be done if somehow the world is “lucky” enough to get another installment. With brutal dialogue and a couldn’t-care-less story, it would be hard for most casts to make nothing into a relative something. The cast in H:A47 tries. Rupert Friend does look like the signature Agent 47, and plays his character how it should be: Cold and machine-like. There is little to find out about 47, though, and he ends up really being a background character to Hannah Ware’s Katie. Ware is fine, but it is hard to buy her as an all-intelligent, two steps ahead person as time goes on, as it hardly feels like she is progressing. Quinto, as Agent Smith, is as generic as the name Agent Smith, seen in The Matrix over 15 years ago. Often, I am more than supporting for casting unknowns into most films, but when the plot is so bare along with most of the characters, sometimes a legitimate superstar or superstars are needed to cover for the sins of the the producers, writers, and directors. It is hard to get excited in films based on video games anymore. Surely one day there will be an awesome video game adaption for the big screen that pleases fans and critics alike, but Hitman: Agent 47 isn’t that adaption. On the bright side, at least it isn’t directed by Uwe Boll. Editor’s note: The gunplay feels “Wickian” in nature because its second unit (assistant) director, David Leitch, is the man who went uncredited but directed John Wick along with Chad Stahelski. Photo credits go to aceshowbiz.com, businessinsider.com, and dailymotion.com. I would have liked to see Walker take on the Hitman role, but as much as I like him, I’m not sure he could pull it off. Friend is a strong point of this movie and if sequels are made, I think it would be smart to keep him in the role. He’s signed contractually for 3 as they make anyone do who signs up for a franchise such as this..and to be honest..the sequel might be better!! ha! *sighs* This doesn’t surprise me. Still waiting for that decent film based on a videogame but the search continues. Great review. With the cast that will appear in Assassin’s Creed, most think that it, when released, will be a pretty good film adaptation of the game. 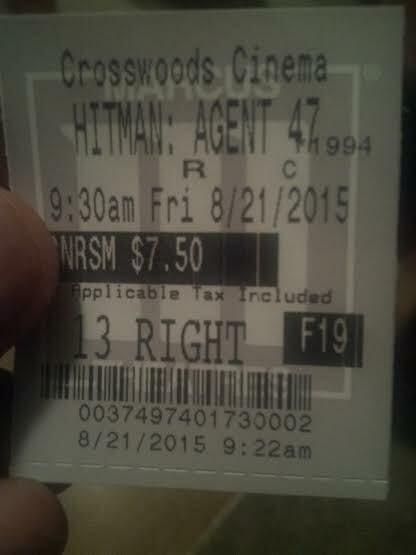 I gave up on AC after the first, but I’ll watch for Fassbender. If I could see one recent game get the film treatment, I’d want it to be Dead Space. Not even a huge horror fan but I’d watch. It has the mythos, could deliver on the scares, and not be bad. Can’t wait to see Fassbender in Assassin’s Creed but at the same time I’m keeping my expectations low as it could easily turn into that Prince of Persia film! Guess out of the video games turned movies, I still have a soft spot for Mortal Kombat.